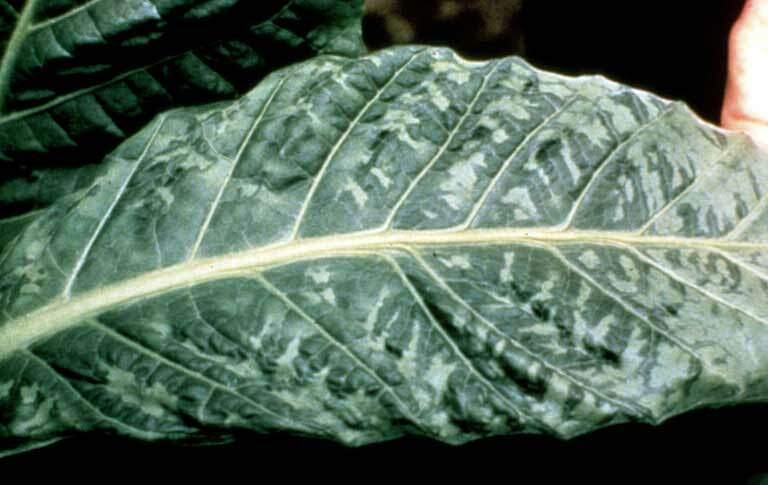 Tobacco Mosaic Virus (TMV) is a virus that is commonly found in tobacco plants which causes splotchy or twisted leaves, strange mottling symptoms (a “mosaic”), slowed growth, and reduced yields. Mosaic virus has spread to several other species of plants, and there is evidence that cannabis plants may be able to catch mosaic virus, too. Although mosaic virus can’t hurt you (the grower), it can prevent plants from growing as fast or yielding as well as they could have. 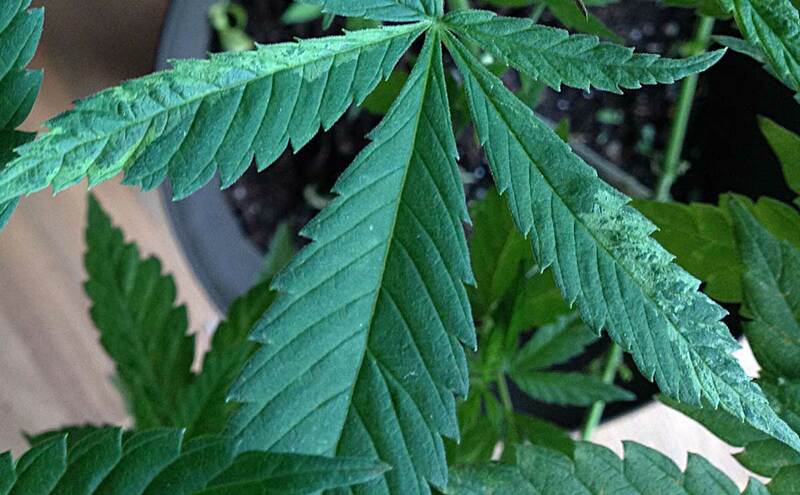 Can Cannabis Plants Catch Mosaic Virus? 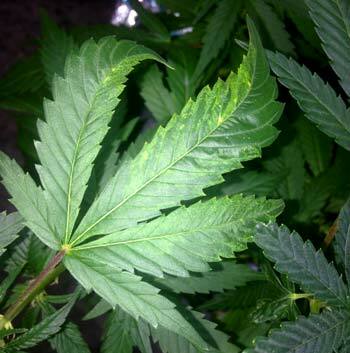 These pictures show the symptoms of what several marijuana growers believe to be the result of mosaic virus, including twisted, curved leaves, yellow stripes, spots and a mosaic pattern. However, it’s important to note that these symptoms could potentially be caused by a mutation or other genetic factor. It’s also possible that other plant problems such as heat, root rot, stress, nutrient deficiencies, etc. could cause similar symptoms. You may need to worry about TMV if the affected plants are growing slowly, seem sickly, and generally aren’t producing normally. The leaves may look like they have uneven stripes of light and dark green. Yellowing is worse on the parts of the leaves that are deformed and twisted. 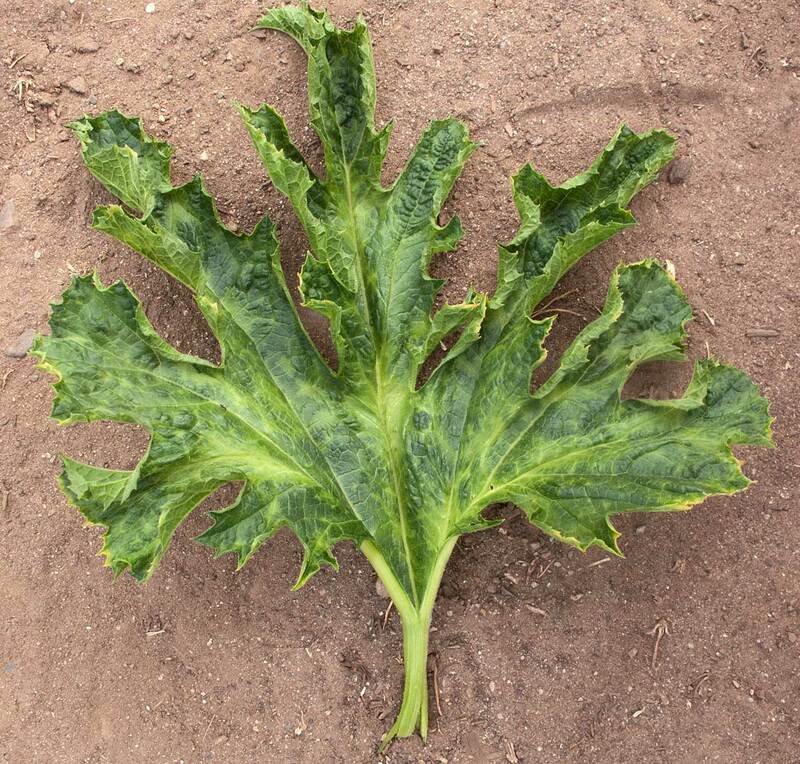 For many plants suspected to have mosaic virus, the dark green areas tend to be somewhat thicker than the lighter portions of the leaf. 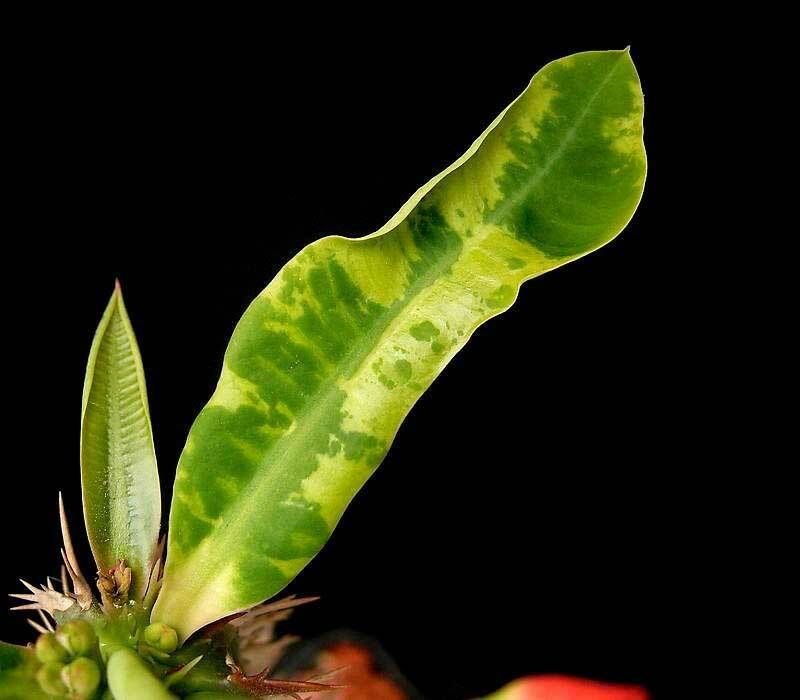 Curved leaves with yellow stripes or mottling are usually considered the main symptom of mosaic virus. In my experience, some growers swear their crops have been greatly affected by TMV, while others deny that it’s actually even spread to cannabis plants at all. The mosaic virus can be difficult to test for, even in a lab. The main problem with TMV is that it may cause plants to grow slowly and produce poorly. If your plant is growing fast and healthy, with no other symptoms, and you’re not noticing it spreading from plant to plant, you probably shouldn’t get too worried. You think another problem may be causing the symptoms, such as nutrient deficiencies, root problems, heat stress, etc. When it comes to cannabis plants, curved leaf “fingers” can be caused by many things, including a random mutation, incorrect pH, watering problems, root problems or other deficiencies. However, with TMV the twisted growth is accompanied by a speckling/mosaic pattern. 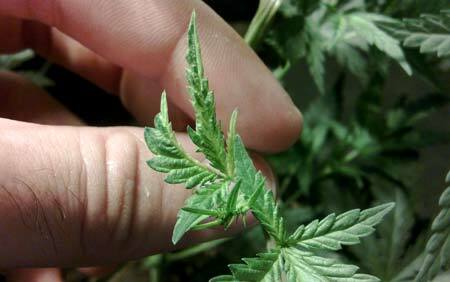 Several leaves throughout the plant can display symptoms, or it may just be one or two leaves. With other species that get mosaic virus, some plants are silent carriers and may never show any symptoms. 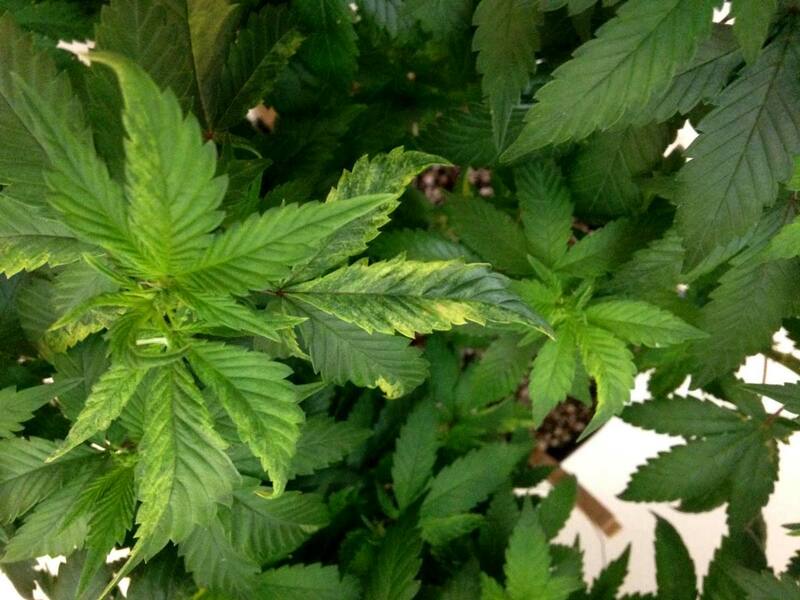 It’s easier to see the leaf mottling if the affected plant surface is partly in the shade. Mosaic virus can potentially stunt young plants that display a lot of symptoms, and may also cause odd, fern-like growth on young marijuana leaves. 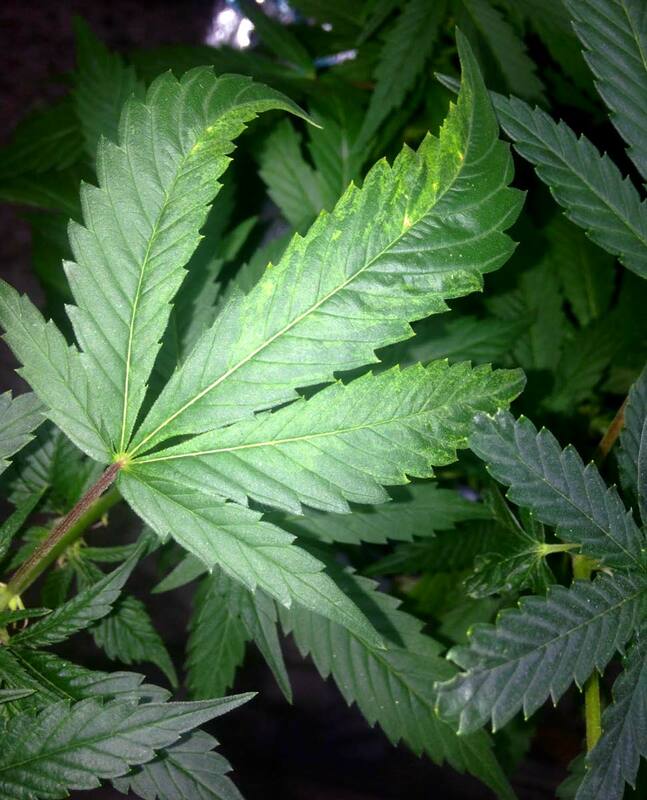 There are sometimes yellow spots or speckles that appear on the unhealthy parts of the leaves. A plant virus can be hard to pin down, since many factors can cause similar symptoms. Unfortunately, a virus can also transfer from plant to plant, so a grower might think they’re dealing with an environmental factor instead of an infectious disease. However, when you have unexplained symptoms that look like pictures of TMV, it’s definitely something to consider! 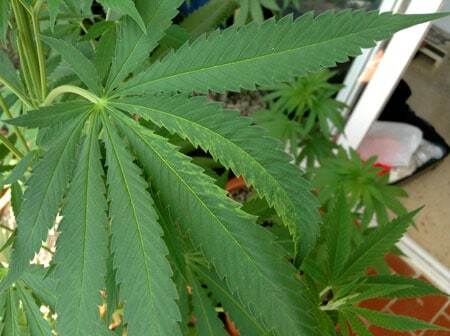 Luckily, mosaic virus appears to be pretty rare in marijuana plants! Fun Fact: Tobacco Mosaic Virus was the first virus ever to be discovered! The mosaic virus can attack a wide range of plants, including tomato, pepper, eggplant, tobacco, spinach, petunia, marigold, and maybe even our beloved herb marijuana. Here’s a pic of a tobacco plant with confirmed TMV – the mottled leaves are the main symptom of the virus besides overall slow growth. 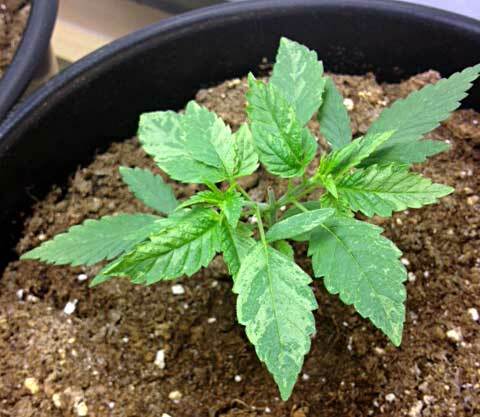 How can cannabis plants catch mosaic virus? The mosaic virus has spread from tobacco plants and is known to infect at least 125 species of plants, including tomatoes, peppers, cucumbers, and many types of flowers. But as of yet, it’s not widely accepted that it can infect cannabis. The pictures presented today are all possibly cannabis plants with mosaic virus. They appear to follow the symptoms of mosaic virus in other plant species, and the problem seems to spread from plant to plant like a virus. What do you think? Just regular plant problems or something more? 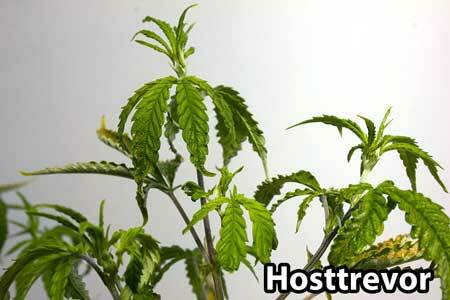 Do these cannabis plants have mosaic virus? At this point, cannabis growers haven’t confirmed for certain that these leaf symptoms are caused by mosaic virus! The thing that really stinks about TMV is if it does affect cannabis plants, that also means it can travel from plant to plant by direct contact, just like the virus does in tobacco plants. It’s known that the mosaic virus can also live in the soil, or be transferred from one plant to another via your hands. Some growers have claimed to see the symptoms after exposing their plants to tobacco or tobacco smoke. Unfortunately, few cannabis growers have the equipment or the means to test if a plant actually has TMV, and a lot of the leaf symptoms could possibly be caused by other things! Without proper testing, we pretty much have to go by comparing and guessing! I’ve never seen these symptoms myself in real life, but I would love to see it because I could test if I could get other plants to “catch” it via physical contact! How do you treat a cannabis plant has mosaic virus? We’re not sure if marijuana can catch TMV, but we likely should treat it the same way we do with other types of plants that catch mosaic virus. Unfortunately, when it comes to mosaic virus, there is no cure. An infected weed plant will have TMV forever, though it may not always be actively showing symptoms. 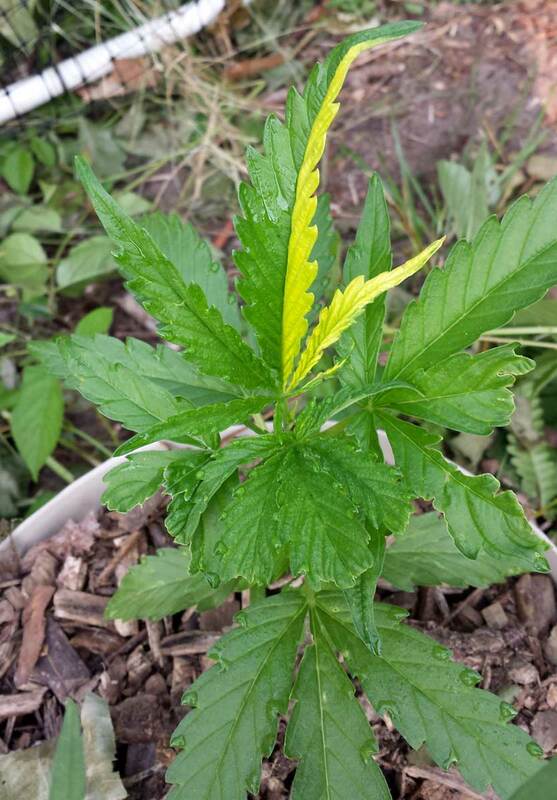 If you believe you have a marijuana plant with TMV, your main goal is to prevent it from spreading to other plants! In greenhouse and commercial operations, the main way to deal with mosaic virus is to dispose of all affected plants, including any soil they were growing in, and enforce a strict policy of hand washing between touching plants. Luckily TMV probably won’t kill your plants, and there’s no evidence it will hurt you if you harvest the plant, but infected plants grow slower and end up producing smaller yields so you definitely want to keep it out of your marijuana garden! 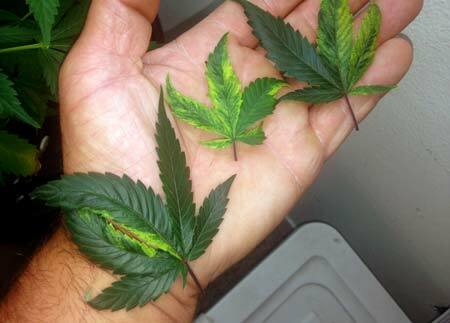 Have you ever seen cannabis plants infected by Mosaic Virus? Let us know! 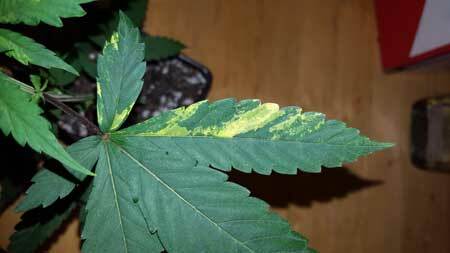 Some cannabis plants may show mutations such as variegation (two-toned leaves), and this normal and natural phenomenon may be confused for TMV. One difference is the plant otherwise grows fast and healthy. Two-toned leaves (variegation) is a common mutation. Nothing to worry about if plants are otherwise healthy and fast-growing. There are other plant problems that can cause similar symptoms. It’s always a good idea to investigate and see if it might be something else! “Mosaic” disease is caused by a virus. The tobacco mosaic virus is very stable and can persist in contaminated soil, in infected plant debris, on or in the seed coat, and in manufactured tobacco products. The virus is transmitted readily from plant to plant by mechanical means. This may simply involve picking up the virus while working with infected plant material, then inoculating healthy plants by rubbing or brushing against them with contaminated tools, clothing, or hands. Virus diseases cannot be “cured” once a plant is infected! Therefore, every effort should be made to prevent introduction of virus diseases into the garden. Sanitation and cleanliness is the primary means of controlling virus diseases. Infected plants should be removed immediately to prevent spread of the pathogens. The use of tobacco products during cultural practices should be avoided to prevent inoculation of plants with the tobacco mosaic virus. Anyone who uses tobacco or works with infected plant material should wash their hands thoroughly in soapy water before handling marijuana plants! Cannabis bugs, mold and other annoying pests!